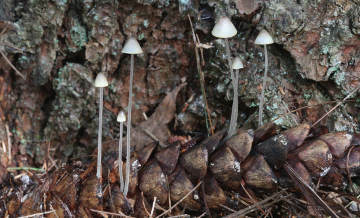 Many mushrooms grow on the ground or on wood, but these tiny mushrooms (most likely a Strobilurus species) grow right out of a fallen pine cone from an eastern white pine, a common tree in Westborough’s woods. Do we have a lot of mushrooms in Westborough? We certainly do, judging from the more than 50 species that mycologist Larry Millman pointed out while strolling along a short stretch of wooded trail behind Mill Pond School on a late September mushroom walk sponsored by the Westborough Community Land Trust. To see even more mushrooms, just wait two or three weeks and different species will be coming up, Larry told the group. He is the author of Fascinating Fungi of New England, the recently published, first-ever guidebook to the fungi we’re likely to see in New England. He answered questions that participants asked or had in mind, but “Can we eat it?” was not one of them. Instead, mushroom identification – “What kind is it?” – must come first, he noted, stressing that accurate identification is the key to answering questions about edibility. “Don’t eat any mushroom unless you are 100% certain of its identity – what mushroom it is,” he cautioned. To get started identifying a mushroom, Larry said, you should look on the underside of the cap to see if it has gills, pores, teeth, or a smooth surface. Another important piece of information to note is the mushroom’s habitat, or more specifically, what it is growing on. Is it growing on the ground, on wood (such as dead logs or branches, a living tree, or underground roots), or something else? That “something else” could be anything from a pine cone (as in our photo) to another mushroom to dung from an animal (such as a bear) that eats a diet that is at least partly vegetarian. “Don’t look for mushrooms, look for their habitat,” he suggested. Mushroom identification gets quite technical. It typically involves making a “spore print” by placing a mushroom cap, gill side down, on a piece of paper for several hours and then examining the color and other characteristics of the spores that drop onto the paper. Identification may also include chemical tests and examining the mushroom or its spores with a microscope. Mushrooms or other visible, above-ground parts are special structures that a fungus produces to make and release spores, as part of reproduction. But the most important part of a fungus is the thread-like underground portion, or mycelium. “This is the part that can be killed when a condo development or asphalt pavement covers the ground,” said Larry. A good time to look for mushrooms is in the days after a rain. “Rain is a mushroom’s best friend for fruiting, or spore-producing, but rain is also its worst enemy – if it gets too soggy to drop spores,” Larry told the group. Why are mushrooms umbrella-shaped? That shape helps to protect the fertile, spore-producing gills, pores, teeth, or smooth surface from rain, and also from drying out. When a mushroom gets very old, it often dries up and inverts like an inside-out umbrella, and this too helps to release the remaining spores. Honey mushrooms (Armillaria mellea) are parasites on hardwood tree roots. They typically grow in clumps from a common base on dead or living trees, but their appearance can vary considerably. One reason is that honey mushrooms may actually be a complex of about 20 species, as recent DNA research suggests. Why are some mushrooms slimy? “Insects don’t like slime,” Larry noted. Slime protects against insects that would eat or lay eggs in the mushrooms. What good are fungi? For one thing, most fungi form a beneficial relationship with plants, known as a mycorrhizal or “fungus root” relationship. In other words, fungi and plants make an underground connection that helps both. 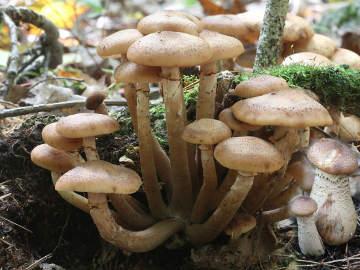 Larry noted that about 90 percent of the plants in New England connect with fungi. How does a “fungus root” connection help trees and other plants? The thread-like strands of the underground fungus associate with plant roots and help the plant absorb water, nitrogen, potassium, and phosphorus. In return the fungus gets carbohydrates from the plant. Up to 20 percent of the carbohydrates made by plants go to underground fungi, Larry said. What else are fungi good for? They play important roles as recyclers in the natural world. Most fungi recycle wood that is dead, or unhealthy and dying. Healthy trees are usually able to resist and ward off most fungi. (The fungal blights that arrive here from other parts of the world and cause epidemics in plants are an exception. One example is the insect-borne chestnut blight that wiped out New England’s American chestnut forests a century ago.) As fungi digest or break down wood, they release nutrients that enrich the soil. This recycling is especially valuable here in New England, which has relatively poor soil due to the scraping action of the glaciers 10,000 years ago. Are mushrooms a kind of plant? People once thought so, but today scientists know that mushrooms are more closely related to humans than to plants. “500 million years ago, we and mushrooms had the same single ancestor, and plants had a different one,” Larry explained. Is it dangerous to touch poisonous mushrooms? Larry says no. You can’t absorb their toxins through your skin. You have to eat them to be harmed. But handling some mushrooms – not necessarily poisonous ones – can give some people a skin rash. night light (Panellus stipticus), mushrooms with gills that glow green at night when fresh and grow in large numbers on hardwood stumps, logs, and fallen branches. So, if you’re looking for something to do on a fall day, take a walk in Westborough’s woods and discover some of the many mushrooms there.